Carroll College track coach Harry Clark entered the Montana State athletics hall of fame. HELENA — Carroll College track coach Harry Clark can add a title to his name — Hall of Famer. Montana State athletics enshrined Saints track coach Harry Clark into its hall of fame on Friday. Clark transferred to MSU from the University of Houston and spent one track season competing for the Bobcats, setting records that remain 30 years later. Clark became an all-American in the decathlon for the Bobcats in 1989. He still holds the school's record with 7,633 points and is on top-10 lists for the outdoor 400 meters, 100 hurdles, long jump and 400 relay. He qualified for four NCAA Championships at both Houston and Montana State. The Cascade native began his collegiate track and field career at Houston. An allure of learning from one of the greatest track and field coaches, Tom Tellez, and training with future Olympians pulled one of Montana's most decorated track athletes down to Texas. 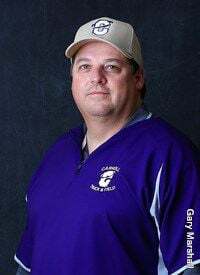 Three years under Tellez, his upbringing, learning under his father National High School Hall of Fame coach John Cheek prepared him to become a coach. Long conversations with Cheek, a longing to return to his hunting and fishing roots in Montana and a bit of foresight led Clark back to Montana. Clark knew it was important to to finish his college career in Montana to springboard into coaching. Though that career was put on hold for a few years of semipro football and a few more decathlons, Clark always knew he would coach. He jokes now that coaching is all he knows. Now in his seventh season of coaching the Saints and 18th year overall, each step along the way — 20 high school state medals, all-American status in the decathlon and training alongside Olympian-level talent — shaped the way Clark approaches running Carroll College's program. "It shows a passion for coaching," Clark said. "And where I started with it at Houston. Those are my roots. My dad was a high school coach. I've been doing this since sixth grade. To take that knowledge and how you prepare athletes, (Dad) was really good at that part. And then that knowledge I got at Houston and at Montana State ... each step in that process has helped us become how good we are now." Clark has coached 164 Carroll College athletes to becoming NAIA All-Americans. The track team averages 12 all-Americans per season. Under the Halo, the only podcast that encompasses all of Carroll College athletics, is back for your viewing pleasure.